The cold snap has hit us hard, we are trying desperately to stay warm and comfortable. Late nights at practice for the kids has left us shivering and starving and search for something warm and delicious when we come home. 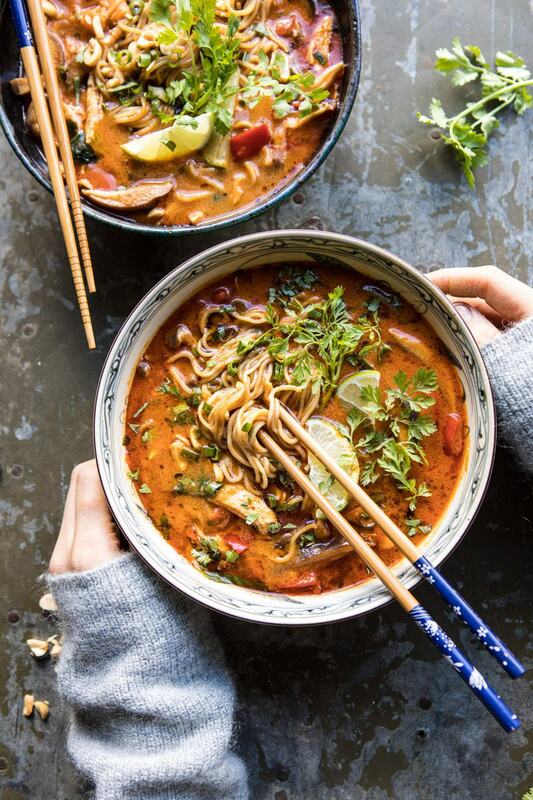 We all love a good ramen soup so when I stumbled upon this Thai inspired ramen recipe I knew it had to make its way in to our soup rotation. Ramen soup is such a fun and simple way to do soup. It can be dressed up or dressed down according to the tastes in your household. We have some adventurous soup eaters in our house so I was not worried about introducing this one. If you have picky eaters and want to make this less adventurous try eliminating the red curry paste and the mushrooms. I found this recipe at Half Baked Harvest and have fallen in love with it. It is the perfect Thai soup, not too spicy, not too adventurous, it was just right for our family. You can spice it up if you want more of a kick, but we found it to be spot on. We even made it in the instant pot so that we didn’t have to wait too long for a spectacular meal after practice. It cooked wonderfully very quickly and we were fed and bathed and ready for bed right on time. Be sure to check out Half Baked Harvest’s other amazing recipes when you head over for the full tutorial and recipe. You will not be disappointed. This entry was posted in Food & Recipes and tagged half baked harvest, half bakled harvest, meals, ramen, recipes, simple meals, soups, the boys store, winter meals on February 10, 2019 by Lacy.